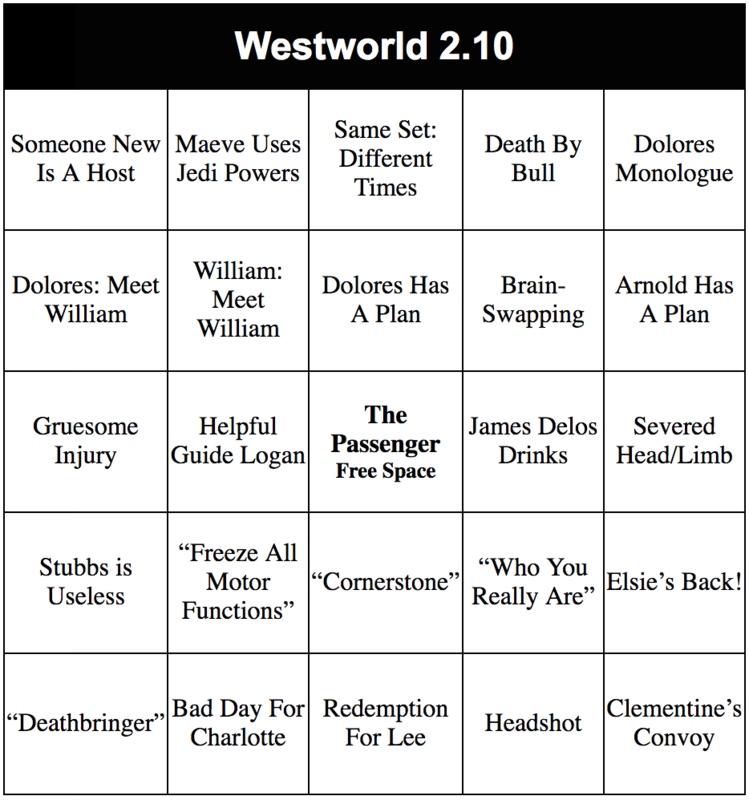 I watch Westworld with a group of friends, and as we all enjoy games, I’ve been making bingo cards for each episode. 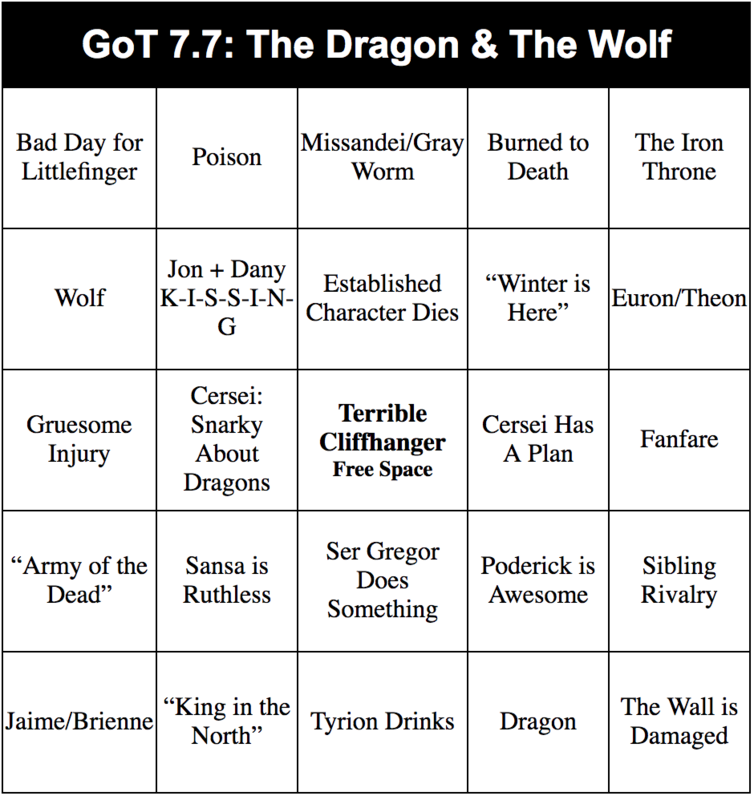 I have no advanced knowledge of what is going to happen, and I when making bingo cards I like to put in squares that MIGHT happen as opposed to simply putting in things that we KNOW will happen… that way, as we’re watching the episode, we are watching for certain things. In the preview we’ve seen a clip of James Delos with a glass of whiskey in his hand… but will he actually drink any? Will we have a scene with a host William meeting a flesh and blood William (William: Meet William)? Will someone’s brain/personality be placed in someone else’s body? I DON’T KNOW—but if so, I might get a bingo! 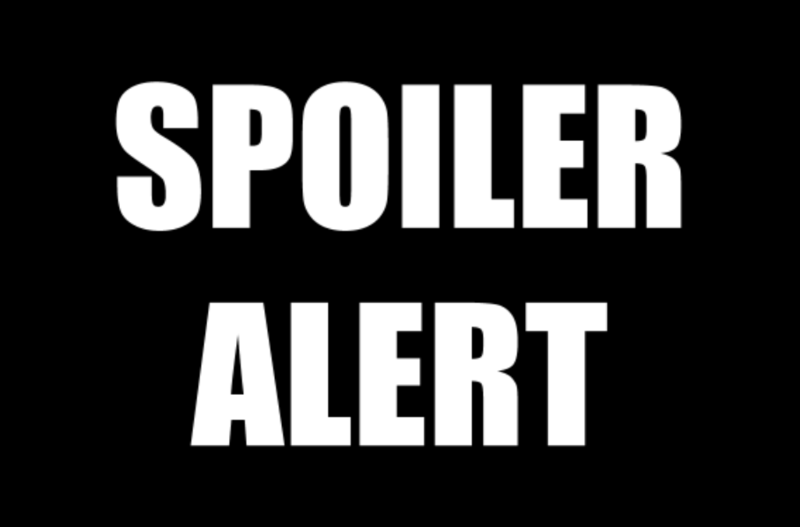 So again: these spaces aren’t spoilers in the sense that I don’t know if any of them will happen, but the whole thing is filled with potential spoilers for people who haven’t seen the episode, hence the alert. 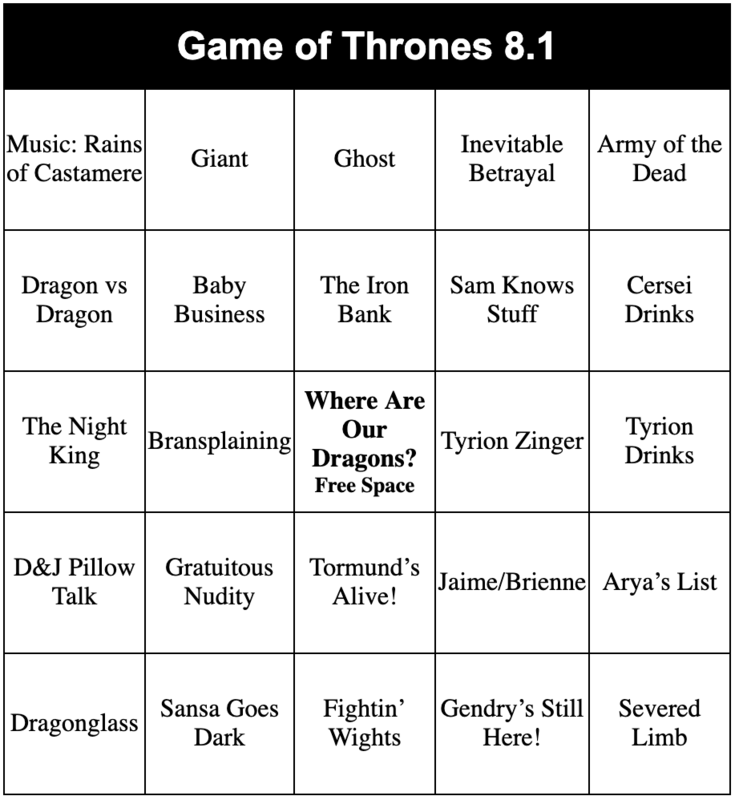 It’s Oscar night, and that seems as good a time as any for bingo. Will there be an awkward billboard-related joke? Will someone pronounce Saoirse Ronan’s name correctly? Will John Travolta be there, and if so, why? 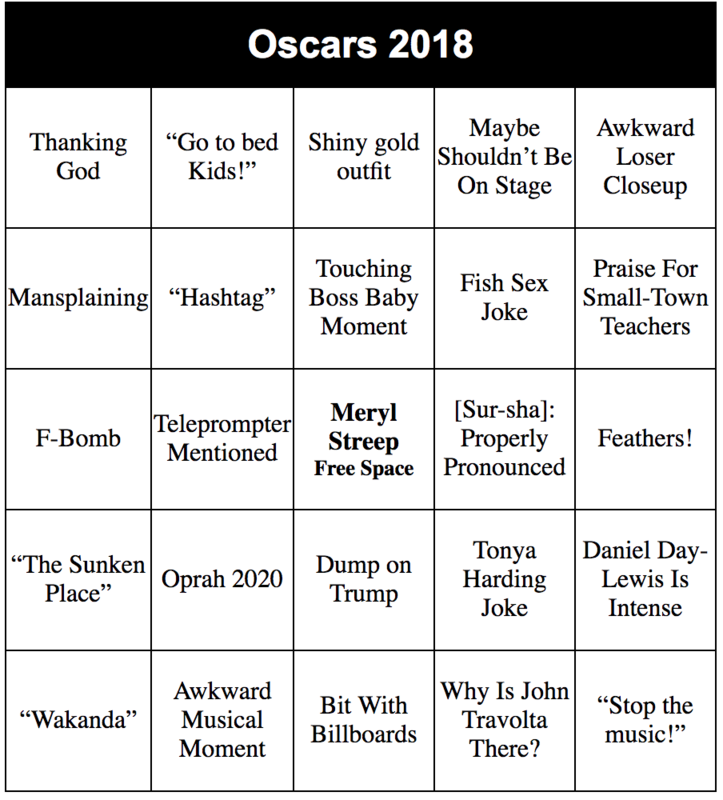 Here’s a set of sixteen cards: Oscar 2018 Bingo Cards. If a word is in quotes – like “Hashtag” – that means someone says the words. If something is open to debate – such as Maybe Shouldn’t Be On Stage – debate away. Enjoy! “words words words” means someone says that phrase – so someone has to say “Mother of Dragons”. person/person means that those two characters have some sort of interesting interaction. Since we know there’s a big meet-up this episode, will the Hound and the Mountain have a moment? Will Davos and Bronn share some snark? I don’t know what’s going to happen, but I’m crossing my fingers and HOPING it’s going to be a bad day for Littlefinger… and wondering if the episode may end with something happening to the Wall. 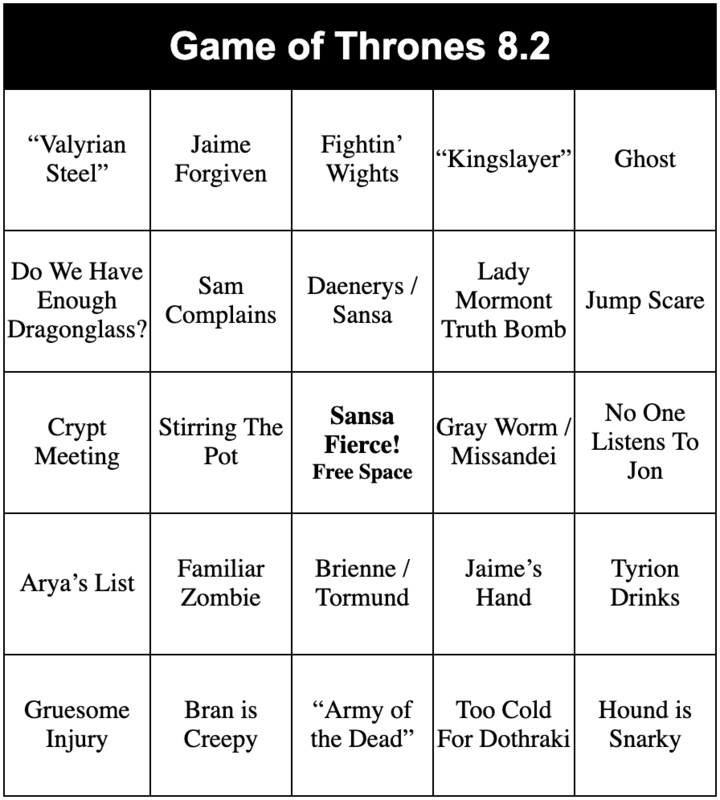 In any case, here’s the bingo cards – enjoy! If something is in quotes, we’re looking for the exact phrase. If it’s not in quotes, the thing in question can appear or simply be referenced. So Superman could be Superman himself; someone talking about Superman; or even a picture of Superman on a wall. We don’t know if all of these things will actually appear in the movie – but hey, searching for product placement can take your mind off how terribly, terribly bad the movie is! 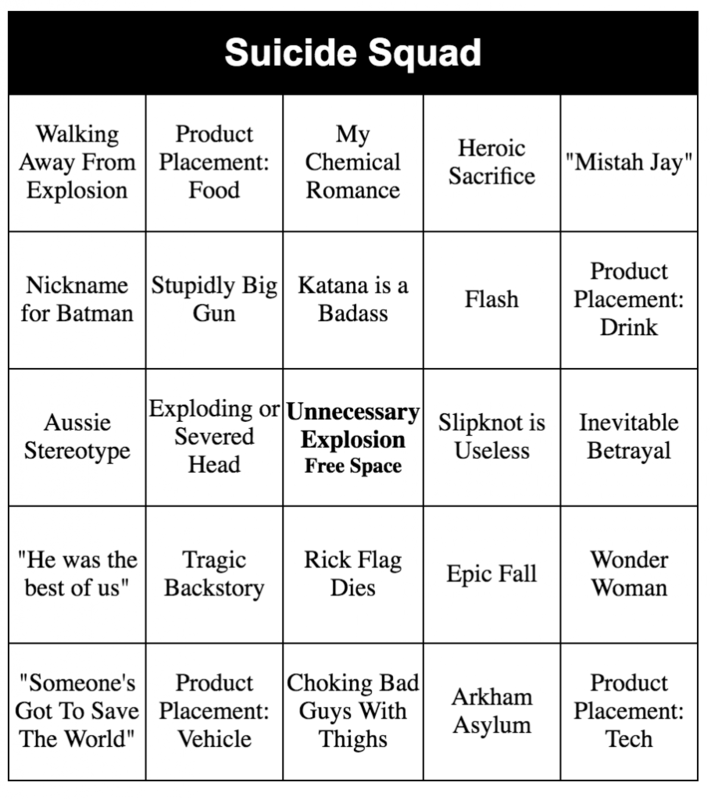 SUICIDE SQUAD BONUS ROUND: Before the movie starts, take a guess at How many named characters will die and write the number on the back. Now there’s two ways to win. Good luck!